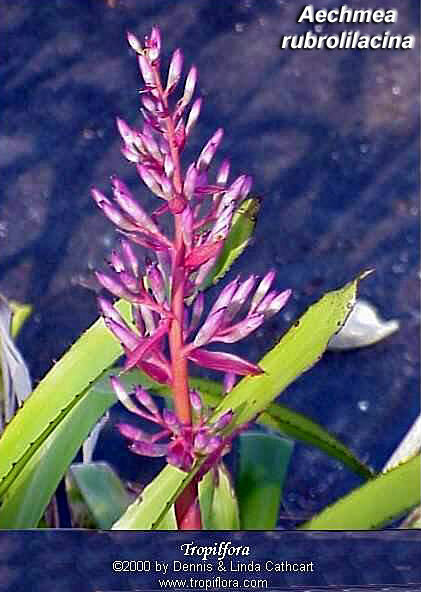 In some Sydney collections as Aechmea melinonii, or Portea alatisepala in Brisbane, or Aechmea macrochlamys. Ian Hook 01/12. ~80cm high in flower. Leaves ~60cm. Sharon Song 02/12. 1st plant. Sharon Song 02/12. 2nd plant. Plants bought by Sharon Song and Ian Hook, from Timothy Tse, Strathfield, Aug 2008. 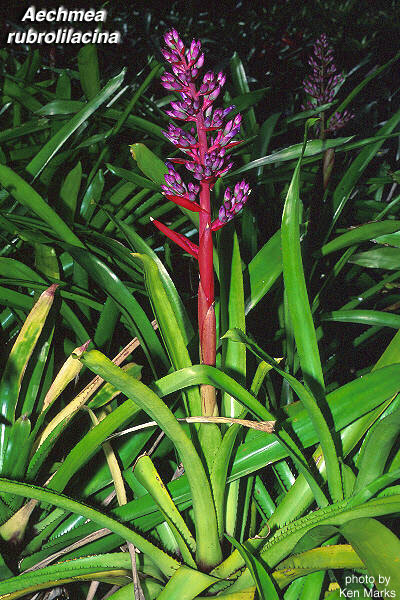 Labelled Aechmea melinonii. Timothy's plants were mostly from older Sydney collections. Aechmea looking plant, but surprisingly flowered like a stunted Portea petropolitana! When I looked on fcbs under Portea to see if anything there, I found Portea alatisepala, and on there an "Uncle Derek Says" article. 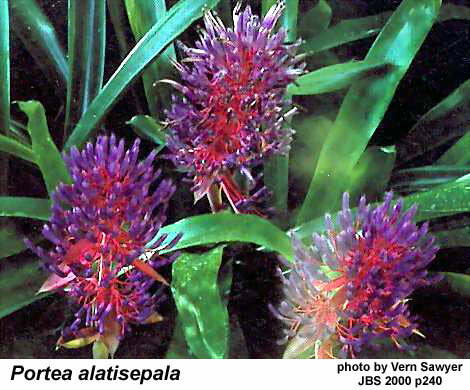 The article details the naming problems seperating Portea alatisepala, Aechmea rubrolilacina and Aechmea macrochlamys. I will be re-labelling my plants based especially on the shorter flower and less erect plant shape (c.f. P. petropolitana), and distinct large spines. 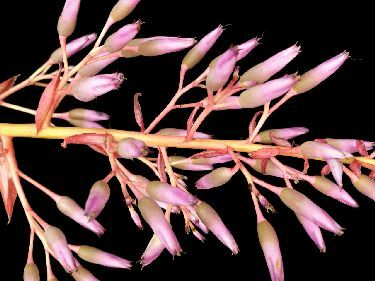 But plants of Queensland origin, labelled Portea alatisepala, and shorter inflorescence again, will keep the Portea label. 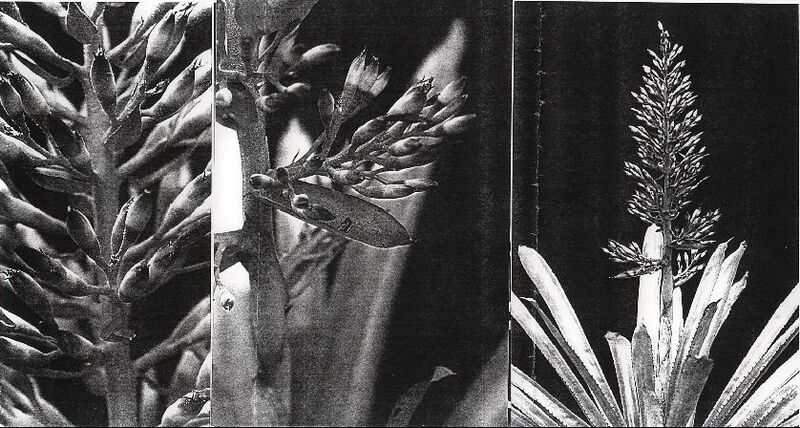 "The late Peter Kearney from Sydney was a discerning collector of Bromeliads but regrettably kept few records and we do not know where he obtained many of his plants. His plants moved down to the Illawarra area when Bob Gray acquired his collection a few years ago. As many of you know, I would have had great fun watching the alleged species flower and seeing how they keyed out. 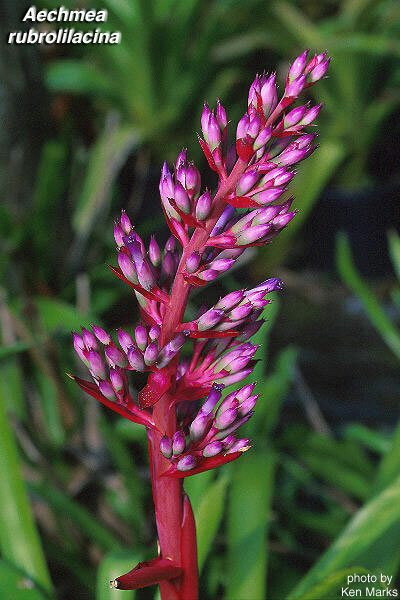 One plant was called Aechmea rubrolilacina (fig. 1) which I was shown at the Illawarra Conference in October 2001. The name did not register but the flowers had pedicels which suggested the genus Portea. On my return to Adelaide I contacted Harry Luther and now have the original description. It shows that Elton Leme named this plant in 1993 as an Aechmea purely because he does not like Portea considering that there is no real botanical distinction between it and Aechmea. I maintain that if there is an accepted genus then it should be used. If not, then a thesis should be written detailing the disagreement and transferring all the other species into the new arrangement. 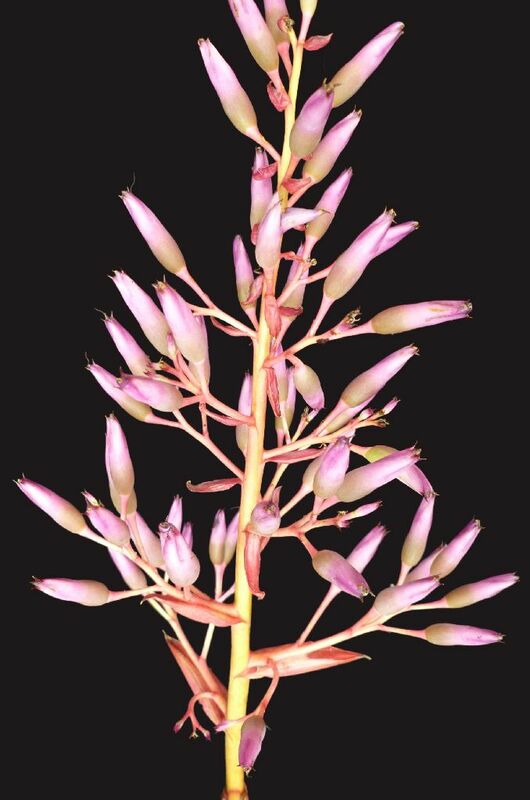 In my Key to the Bromeliaceae in the 'Classification' Section I have covered this particular problem by citing Aechmea rubrolilacina as an exception outside Portea. 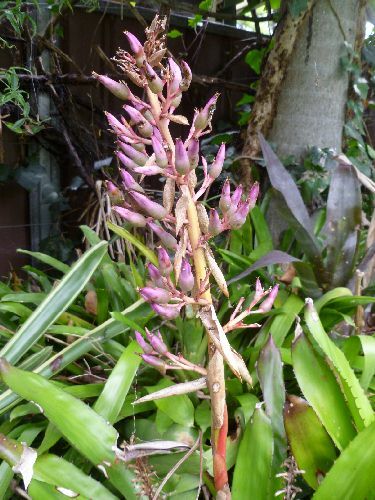 There is a similar plant growing in Queensland as Portea alatisepala. Again, I do not know how it got into Australia but there is a photograph in the JBS 1986 page 288 (fig. 2) under the name Portea silveirae which in subsequent journals was changed to Portea grandibracteata and more recently to Portea alatisepala. 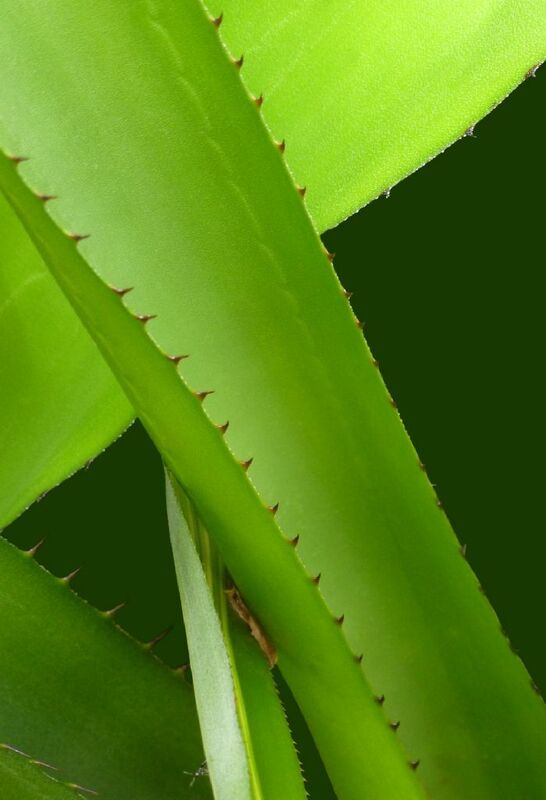 Clearly, this is a plant which is difficult to identify. In JBS 2000 page 240 there is another photograph of this species, this time from Marie Selby Bot. Gardens (fig. 3). As Harry Luther pointed out to me there are similarities between Portea alatisepala and Aechmea rubrolilacina and even threw in the names Ae. macrochlamys and Ae. melinonii to be wary of!! 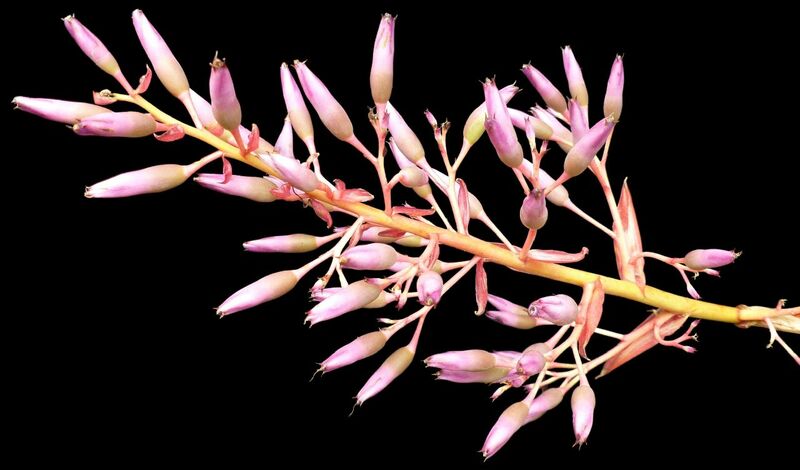 By the way, Portea alatisepala was named and described by Philcox in 1991 where the plant had been collected some 14 years earlier in 1977! Who said botanists have a short memory? 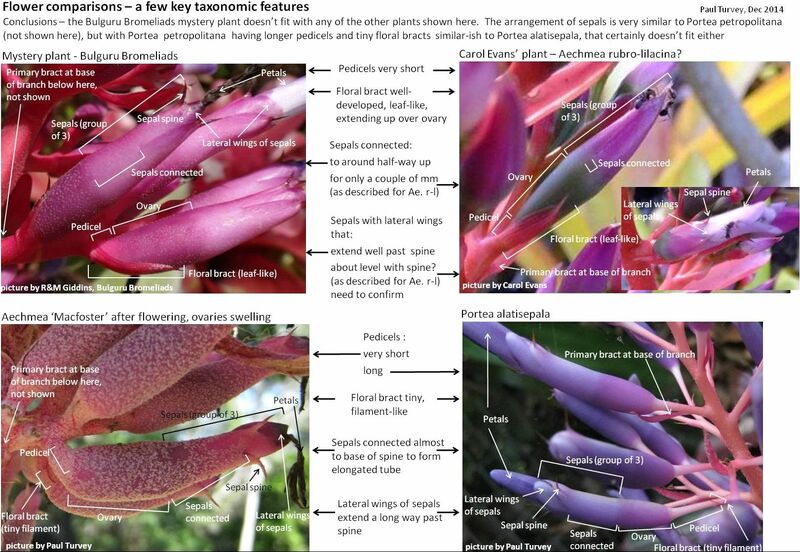 I have managed to acquire both original descriptions which are shown below because few bromeliad growers would have seen them. It does appear we have similar looking plants in Australia, one called Portea alatisepala in Brisbane and the other called Aechmea rubrolilacina in Sydney. 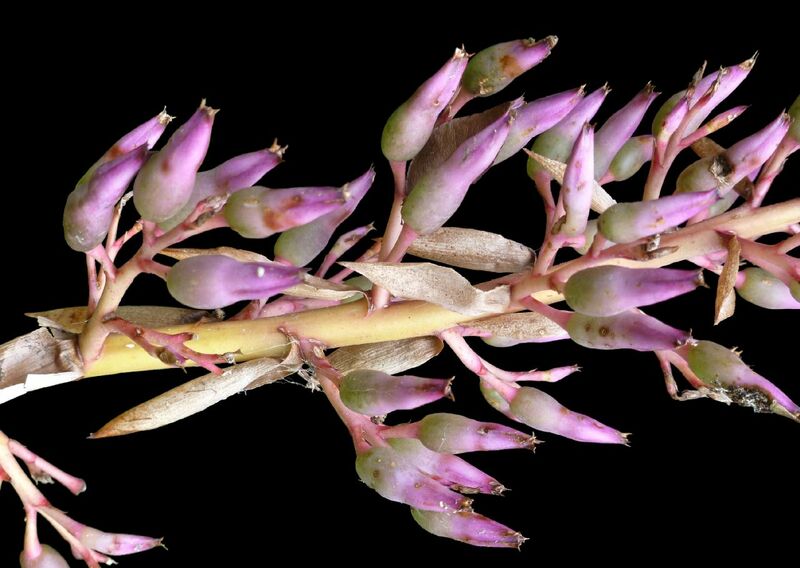 There must be a similar problem in America because Aechmea rubrolilacina is on offer through Tropiflora (fig. 4). I would warn against changing labels yet, until the matter has been investigated properly. 1. The owner of either plant may wish to check against the description and advise me their findings. 2. 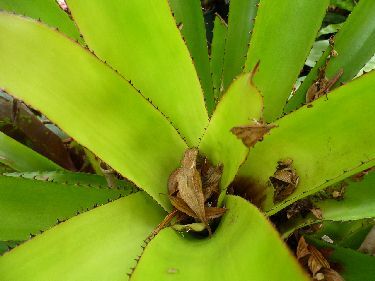 Or, send the inflorescence and one entire leaf to the Bromeliad Identification Center if you are really worried and want a second opinion." Reference photos of other plants discussed here. Click here for more Portea alatisepala pictures. Leaves ca. 13 suberect, rosulate, forming a funnel shaped utriculum at the base. Sheaths broad elliptic, ca. 15cm long, ca. 10cm wide, both sides dark purple and almost dense brown lepidote. Blades sublinear, 30-40 cm long, ca. 5cm wide, by no means narrowing towards the base, both sides with inconspicuous but sub-dense brown lepidote, green, tip acute or sub rounded apiculate, edges with sub-dense or lax spines, spines dark brown 2-5mm long. Scape erect, rigid, glabrous, ca. 45cm long, 8-10mm diam. Scape bracts narrow - elliptic, ca. 8cm long, ca. 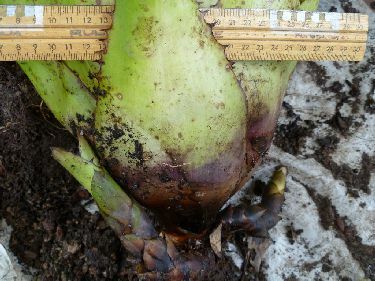 3cm wide, tip short acuminate apiculate, entire, glabrous except for a lepidote tip, erect, imbricate, completely hiding the scape and exceeding the internode. 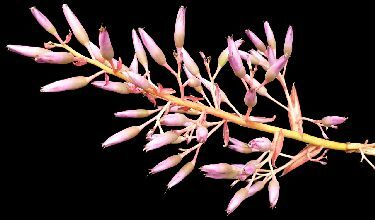 Inflorescence narrow paniculate, tripinnate at the base, bipinnate towards the tip, sub- lax, ca.20cm long, ca. 7cm diam., exceeding the height of the leaves. 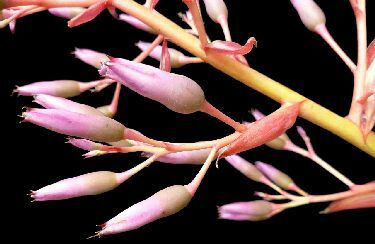 Primary bracts narrow elliptic, short acuminate apiculate, 3-5.5 cm long, equalling the height of the branches or a little shorter, red, entire, sub-erect, inconspicuous white lepidote. Branches ca. 14, sub-erect, short pedunculate, sub -dense flowers, slightly elongated, 4-7cm long. Branch rhachis slender, terete, red, glabrous. Floral bracts elliptic, slightly asymmetric, acute and conspicuously mucronate, 10-17 mm long, 5-8mm wide, red, nerved, inconspicuous white lepidote, entire, equaling the height of the ovary. Flowers 40-50mm long, polystichous, pedicellate, pedicels 2-6mm long. Sepals almost asymmetric, ca. 18mm long, width at its maximum ca. 14mm, ecarinate, 2mm connate from the base, glabrous, at the tip a 2mm long pungent mucron, dark purple towards the tip. 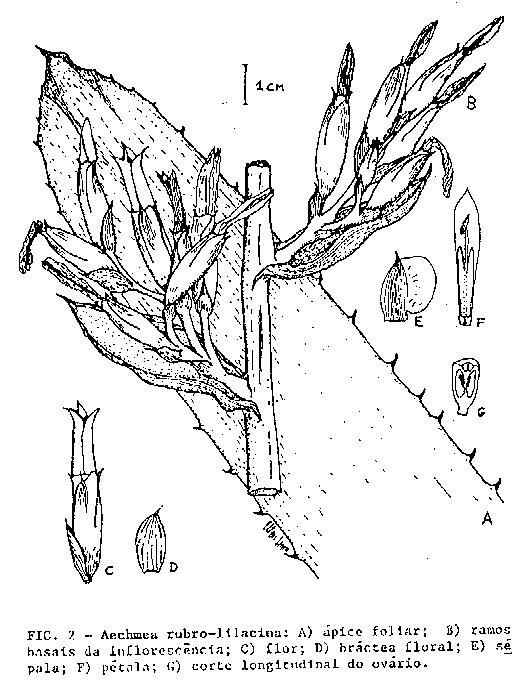 Petals sub-erect, free, ca 35mm long, ca 6mm wide, lilac, tip acuminate, at the base 2 sub-ovate with entire tip ca 2mm long ligules, and also two longitudinal calluses 20mm long. Stamens included, Filaments series 1 free, series 2 high adnate to the petal, Anthers linear, ca 5mm long, dosrifixed toward the middle. Ovary terete, ca 10mm long, ca 6m diam, green, glabrous, Epigynous tube ca 2mm long. Placenta affixed to the top of the loculus, Ovules caudate. 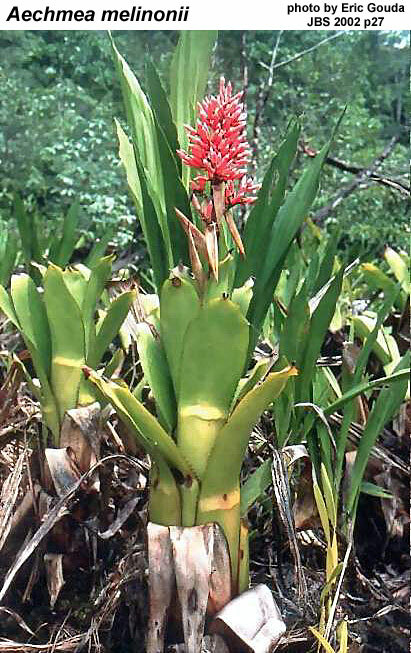 In spite of the presence of floral pedicels, what would indicate-in an artificial vision of the group-the inclusion of this new species in the genus Portea, it is considered that, because of the group of select morphologic characteristics, this unpublished bromeliad should be treated as Aechmea. 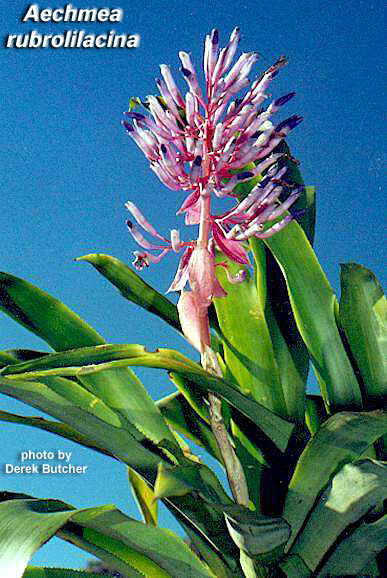 We should observe that, in view of the arguments espoused in recent work that we published (Leme, 1992), we didn't adopt here the proposals taken to effect by Smith & Kress (1989) as to the splitting up of the genus Aechmea. Plant epiphytic, to 85 cm tall when flowering. Sheaths up to 18 x 11.5 cm, subelliptic, entire except towards apex, densely dark-brown-lepidote. Scape erect. pink to 40 cm long, 1.5 cm in diameter, densely floccose, slowly glabrescent. Scape bracts 7- 9( - 12) cm long, imbricate, oblong-cuspidate, minutely serrate, sparsely pale-lepidote, more densely so beneath. Branches 1 - 4 cm long, 1 - 6-flowered. Floral bracts 3- 5 mm long, filiform to filamentous. 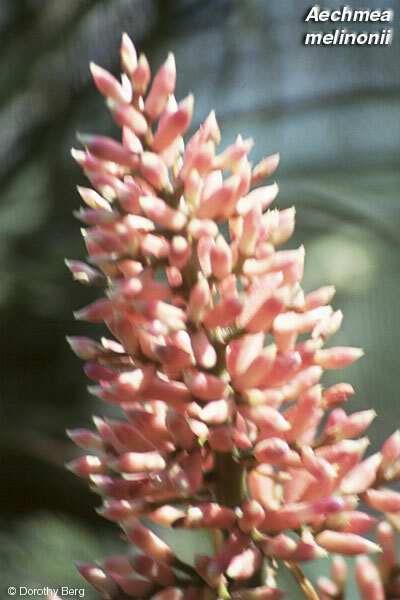 Pedicels 1-1.2 cm long, well exceeding floral bracts, sparsely lepidote,.pink. Sepals 1.0-1.2 cm long, including a 2.5 mm long mucro, pale lilac-blue, strongly asymmetric with broadly obovate wing 7- 8 x 6 mm extending upwards and outwards some 3- 5 mm beyond apex of main lobe. Petals to 4.5 x 0.6 cm, linear-oblong, lilac-blue with 2, shortly fimbriate appendages ca. 1.5 mm long at base. Filaments up to 4 cm long, lilac-blue; anthers 7 mm long, greenish-blue. Ovary ca. 1 cm long, terete, glabrous, pale purplish-lilac at anthesis. Habitat BRAZIL. Bahia: cacao plantation between Pedras and Una, opposite CEPLAC Experimental Station, Sea level, 26 Jan. 1977, Harley et al: 18303 (holotype CEPEC; isotype K). 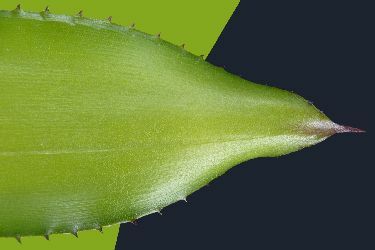 Differs from P. petropolitana in Leaves longer, wider, with many small spines. 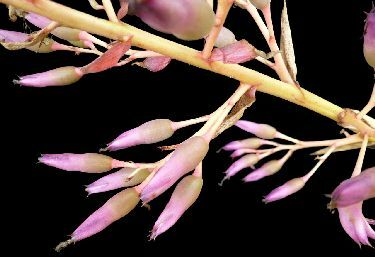 Branches of inflorescence shorter. Floral bracts filiform. Flowers bigger. Sepals characteristically with large lateral wings. Differential among several possible rubrolilacina by Paul Turvey, 12/14. Everyone knows that I always question what is on the label especially if the plant is supposed to be a species. I learnt that from Bill Morris. When a plant does flower you can check it against your own memory or someone else�s memory which are not good ideas! Or you can check it against a reputable reference book, which is a good idea. Or you can check it against the original botanical description which is what Harry Luther tells me is the best idea. Or if this fails send an inflorescence and an entire leaf with the requisite fee to the Bromeliad Identification Centre at Marie Selby Gardens. 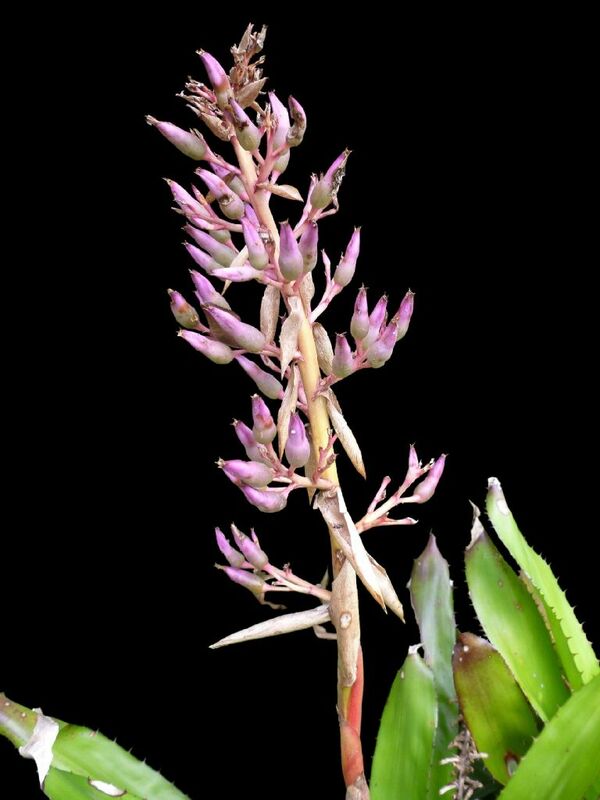 If it is a hybrid you have to rely on the Bromeliad Cultivar Registry and/or the photographs because rarely are there full descriptions. Changing the name on a label is not to be taken lightly, which brings me to the point in question. 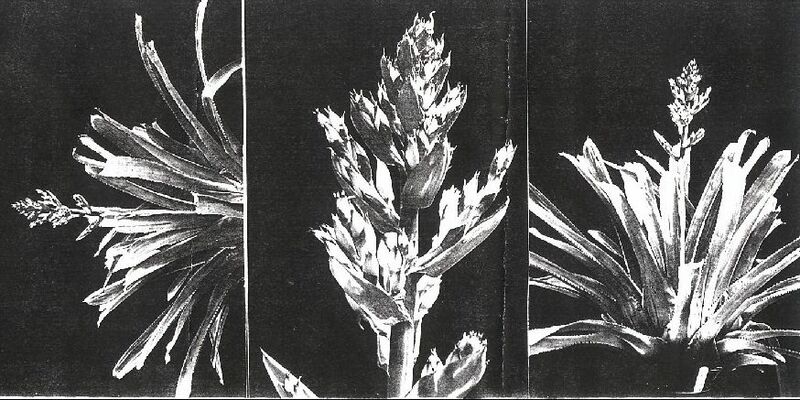 Peter Kearney was a discerning collector of Bromeliads but regrettably kept few records and we do not know where he obtained many of his plants. His plants moved down to the Illawarra area when Bob Gray acquired his collection a few years ago. As many of you know, I would have had great fun watching the alleged species flower and see how they keyed out. One plant was called Aechmea rubrolilacina which I was shown at the Illawarra Conference. 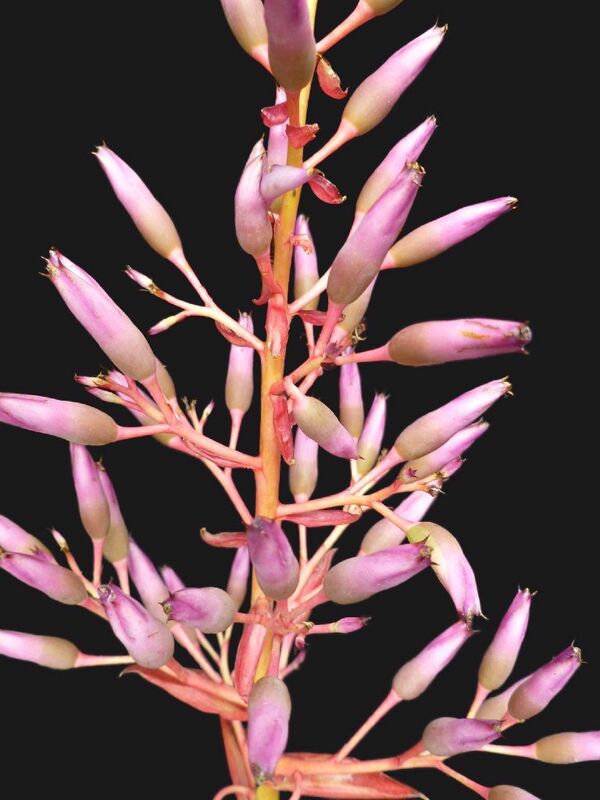 The name did not register but the flowers had pedicels which suggested the genus Portea. On my return to Adelaide I contacted Harry Luther and now have the original description. 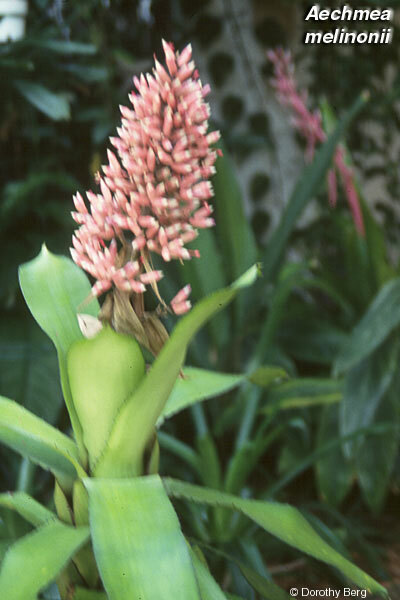 It shows that Elton Leme named this plant in 1993 as an Aechmea purely because he does not like Portea considering that there is no real botanical distinction between it and Aechmea. I maintain that if there is an accepted genus then it should be used. If not, then a thesis should be written detailing the disagreement and transferring all the other species into the new arrangement. 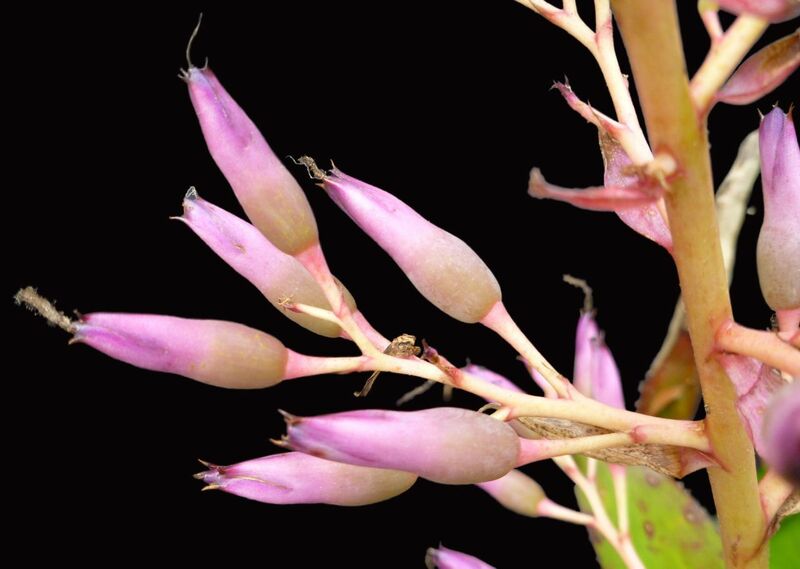 In my Key to the Bromeliaceae on the Website http://fcbs.org I have covered this particular problem by citing Aechmea rubrolilacina as an exception outside Portea. There is a similar plant growing in Queensland as Portea alatisepala. Again, I do not know how it got into this country. As Harry Luther pointed out there are similarities between Portea alatisepala and Aechmea rubrolilacina and even threw in the name Aechmea macrochlamys as another to be wary of!! 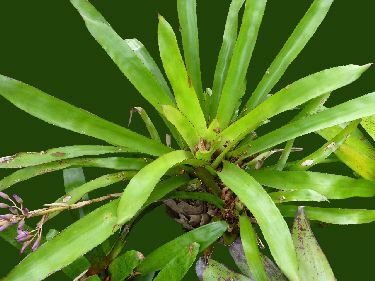 By the way, Portea alatisepala was named and described by Philcox in 1991 where the plant had been collected some 14 years earlier in 1977! 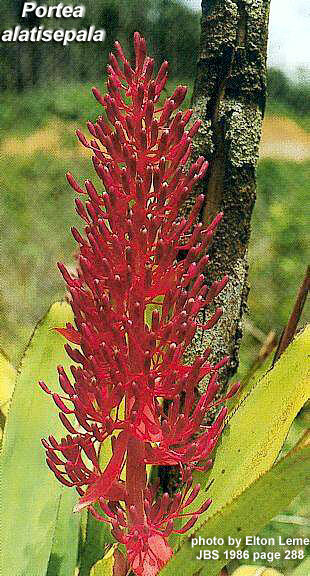 So I have both original descriptions although few Bromeliad growers in Australia would have seen them. It does appear we have similar looking plants, one called Portea alatisepala in Brisbane and the other called Aechmea rubrolilacina in Sydney. 1. If the owner of either plant wants to check against the description please contact me and I will send on a copy. 2. Or send the inflorescence and one entire leaf to Peter Franklin at 52 Rees James Rd, Raymond Terrace, NSW 2324 or myself at 25 Crace Road, Fulham, South Australia 5024 and we will have a poke around for free! 3. 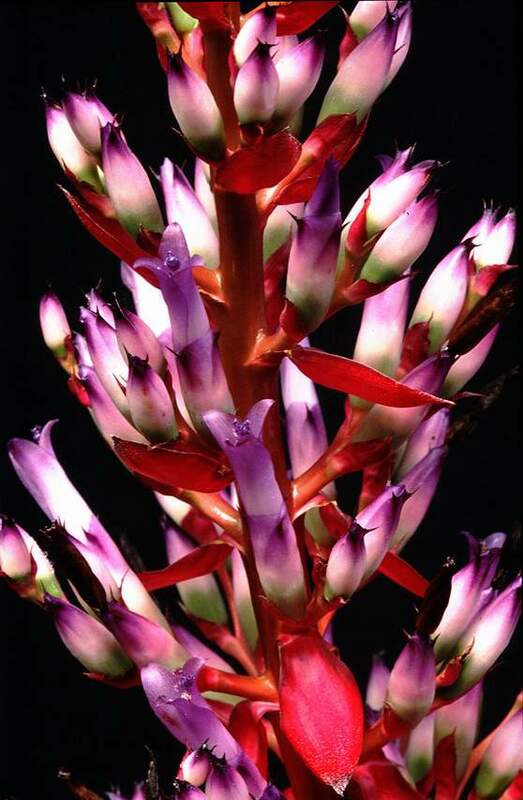 Or, send the pieces to the Bromeliad Identification Centre.